Charles Edwin Nussbaum, 86, was born Nov. 21, 1930, in Pine Bluffs, Wyo., to Claude Sr. and Gladys (Reynolds) Nussbaum. Battling dementia and Alzheimer's, he passed away on Sept. 15, 2017, at Tru Hospice of Northern Colorado in Greeley, Colo. When he was 6 years old, his mother passed away shortly after the birth of twin boys, leaving his father to raise eight sons and one daughter. As he grew up, he enjoyed hunting, fishing, competitive roping and being a member of the Pine Bluffs Roping Club. He had the honor of being an outrider for George Bruegman's chuck wagon races at the 4th of July rodeo in Greeley. He was also an outstanding pool player, enjoyed rodeos, the Denver Broncos and the Colorado Rockies. Chuck attended school at Golden Prairie north of Pine Bluffs and received his GED while in the U.S. Army. He was drafted into the Army, serving his country from April 1951 until March 1953. His overseas duty took him to Germany and when discharged he had attained the rank of sergeant. Returning to Pine Bluffs, he worked at various jobs. On July 30, 1955, he was united in marriage to Dorothy Lola Werner Nelson. In his heart, he always wanted to be a farmer, so by moving across the Wyoming border to the Grover, Colo., area, this dream eventually became a reality. A long story, with no financial help, a lot of toil and help from God, his wife by his side, and four children, his dream became true. He and Lola also owned and operated REC (Rural Entertainment Center) a bowling alley and cafe in Hereford, Colo., for a few years, but farming and ranching was his passion. A partnership with his son Paul was formed and this developed into a successful cow/calf operation. He was a member of Soapstone Grazing Association, later changed to Folsom Grazing Association. He supported his children in 4-H and FFA, serving on the Grover FFA Advisory Board and honored as Chapter and State Honorary Farmer. 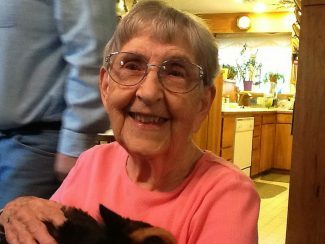 His spirit lives on through his caring wife, Lola, of 62 years; children, Karen (Howard) Archibeque of Greeley, Charles Paul (Carla) of Grover, Colo., Sharon (Paul) Poelma of Carpenter, Wyo. ; daughter-in-law, LeeAnn Nussbaum of Plankinton, S.D. Each of his children carries his determination, kindness, generosity, and sense of humor. Chuck never knew a stranger, and he could carry on a conversation with anyone. He is survived by grandchildren, Kevin (Marisa) Nussbaum of Madison, S.D., Steven (Anna) Nussbaum, and Bryce Nussbaum both of Plankinton, S.D., Courtney Archibeque and Lauren Archibeque both of Greeley, Shannon (Brett) Shreve of Wellington, Tanna (Shawn) White of Oelrichs, S.D., Lauren Hodgson of Greeley, Nikki (Joel) Liesman of Greeley, John (Erica) Poelma of Cheyenne, Wyo. Chuck also had eleven great-grandchildren. In addition he is survived by sister, Betty Necklason, of Sundance, Wyo; and brother, Jay Nussbaum of Cheyenne. He was proceeded in death by a son, Marvin; his parents; brothers, Harold (Bill), Claude Jr., Marshall (Bink), Wesley (Swede), Ray, and Kenneth, who passed away just a few hours after Chuck. A Celebration of Life service was held on Sept. 22, 2017, at the United Methodist Church in Pine Bluffs and burial was at the Pine Bluffs Cemetery. Memorial donations may be made in Chuck's memory to Tru Hospice of Northern Colorado, 2726 W. 11th St. Rd., Greeley, CO 80634 or United Methodist Church, 600 Main St., Pine Bluffs, WY 82082.